You’ve spent months developing a product that solves a complex financial problem. You know that hundreds, maybe even thousands, of people could benefit from your solution, if only they knew about it. Your early users are spreading the word to their close friends and family, but it probably won’t be enough to help you scale. Fintech products tend to be challenging to understand. Your clients want a quick solution; they don’t want to search for options. Good marketing and SEO will make your product easy to find when your client needs it. Marketing can create a sleek image for a generally “unsexy” business model. Even if you know the value of marketing for your fintech startup, you may have no idea where to start. Here are a few great ways to get the word out about your new fintech venture. 1. Use visual marketing tactics. Images can help simplify complex topics. Use infographics or short explainer videos to demonstrate how your product works and grab more attention online. Most of your clients would much rather watch a two-minute video that breaks down your product’s functionality than read a 12-page white paper that details its uses. For example, Mexican small-business loan startup, Konfio, uses simple branded images and 30-second native Facebook videos to explain how to use their app. Not only are these videos relatable, so clients understand precisely how the product can help them, but they are also optimized for social media viewing, including captions and mobile responsiveness. If you are using video on Facebook or Twitter, be sure to post videos directly to the platform; native video has an 86% higher reach than YouTube links. 2. Don’t stick to just a few keywords. If you’re a small startup, no one knows about you or knows what you do. Create a large bank of keywords based on what your users might be searching for online to help them find you. What kinds of questions might your target audience ask when they are looking for your company? This answer will depend on whether your clients are individuals or businesses; a sales manager will search for products differently than a suburban mom. Imagine that your client is looking for a payments processing solution in Latin America in Spanish. They are unlikely to scroll through pages of Google results and compare various products before they make a choice. In this case, they would probably land on PayU, a Colombian company that processes online payments and that ranks high on Google for keywords related to this solution. Think about your ideal client’s search intent before you start writing, so they see you first. 3. Beat the banks on social media. 87% of users see banks as clunky, unhelpful, and annoying on social media or through their apps. These channels are a great way to connect with a younger audience who tend to adopt tech more quickly. Speak the language of your ideal users to help them understand why your product is relevant to them. Revolut, a British digital bank, is an excellent example of a fintech company with a strong, youthful social media presence. They are responsive and playful on Twitter, posting memes, gifs, and other references to pop culture. Revolut also uses their social channels as a means of providing more direct customer service, answering questions and concerns directly through Twitter. 4. Don’t be afraid of a strong message. As a fintech startup, you need to pay attention to regulations so that you don’t get shut down. However, you shouldn’t sacrifice your message to the point that it is weak and unconvincing. Facebook, in particular, tends to pull down ads or pages for fintech companies in the cryptocurrency space, so make your point, but understand the rules so you don’t get shut down. 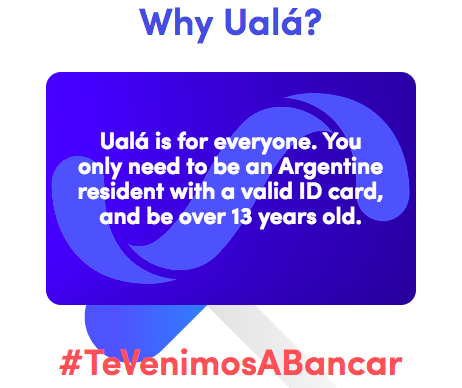 Argentine neobank, Ualá, has taken on one of the world’s most entrenched banking systems with a completely free, mobile credit card. They have reached over 400,000 Argentinians in their first year of business by providing a fierce value proposition across all their channels. Founder Pierpaolo Barbieri has not shied away from stating that Ualá plans to make banks in Argentina obsolete by next year. 5. Focus on customer retention. While acquiring new customers helps you grow, your revenue comes from existing customers. It costs five times more to acquire a new customer than to retain one. Make sure you continue to educate and serve the customers that are already using your service. Produce content that helps them take advantage of all of your services and prioritize their concerns when you create new campaigns. Chilean cryptocurrency exchange platform, CryptoMKT, has created separate, educational pages for each of the countries where it operates across Latin America to keep users updated on pricing and trends in their market. They also explain how to purchase each cryptocurrency in detail, to help buyers understand a particularly complicated and novel topic. 6. Let your marketer do his/her job! Fintech teams are often spread thin between customer service, marketing, and even product management. Your brand will grow faster if your marketing team can focus on distributing news about your service to your target audience. While your marketing team cannot wholly extricate themselves from the internal operations of your business, they should be spending the majority of their time creating and sharing information about your company. If you overburden your marketers, your content will be less effective, and you won’t benefit from the full effect of their work. While digital marketing has become incredibly competitive in many industries, fintech marketing is still an open playing field. Fintech startups worldwide lag behind other startups in their marketing efforts, meaning you have the opportunity to beat out the competition by distributing your content on the right channels, educating your users, and having a strong message. Follow these best practices to help your clients understand and make the most of your service so your fintech can grow faster. Sophia Wood supports startups in Latin America as a Marketing Manager at Launchway Media and working in Operations at Magma Partners.